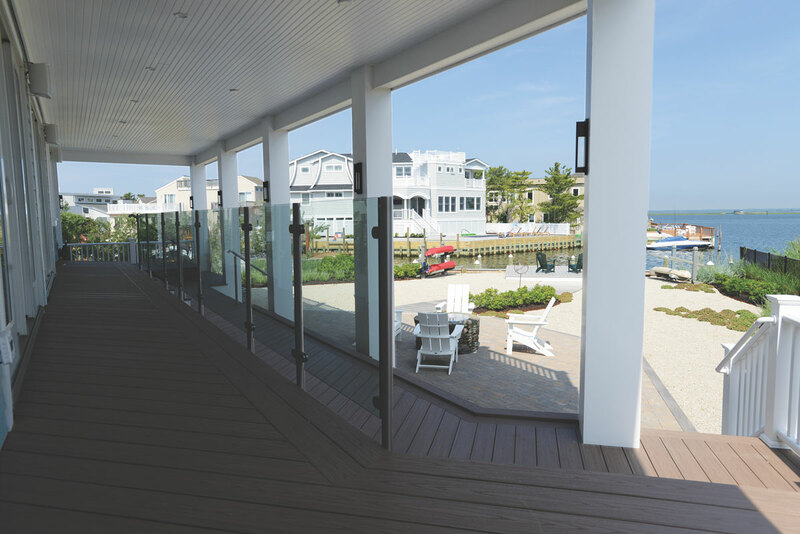 The new home is situated to take advantage of the bay view. 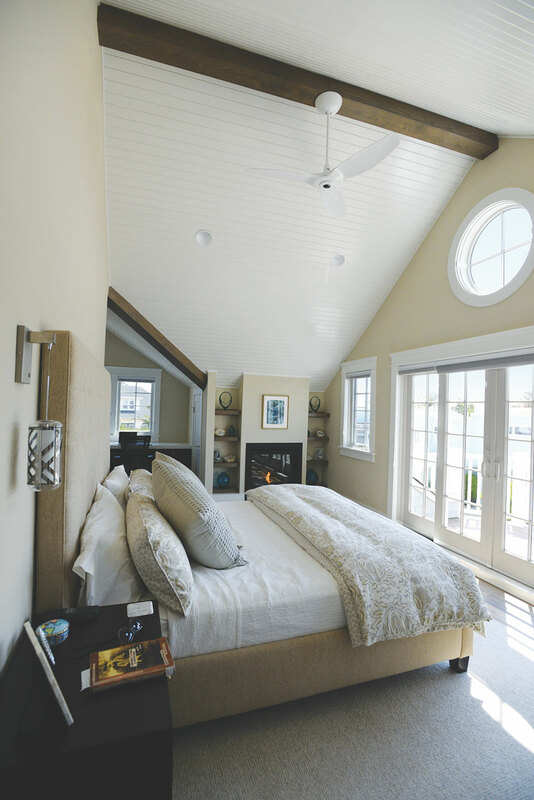 A Harvey Cedars, NJ home is designed to take advantage of its bayside location. It’s called “Belle Baie,” (“beautiful bay”) and it certainly lives up to its name. 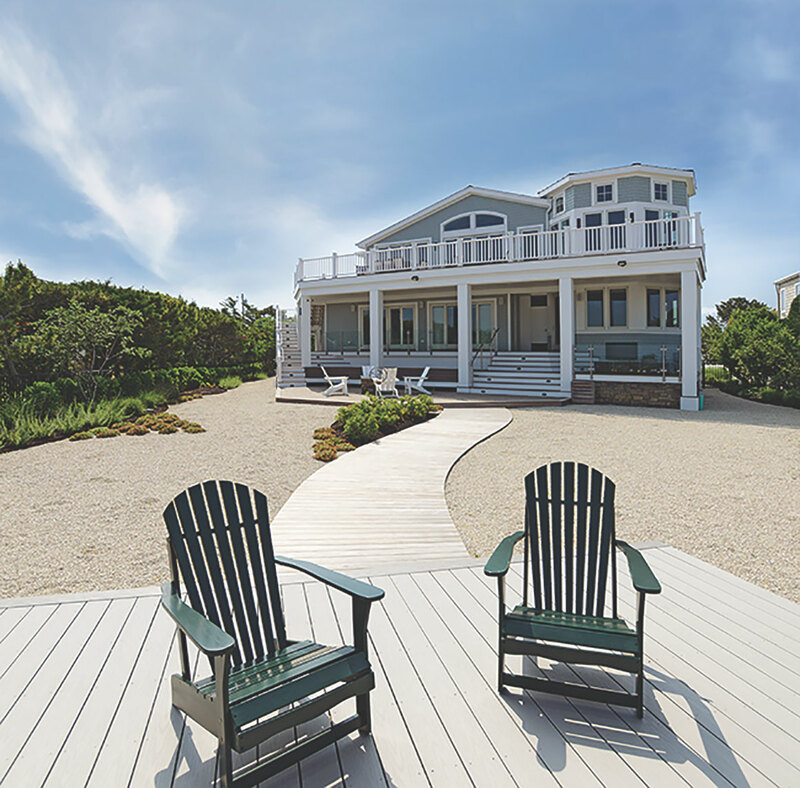 The Masri home, which was featured on the 2017 Seashore Open House Tour, takes full advantage of its waterfront setting in Harvey Cedars on Long Beach Island. But the view is only part of its appeal. 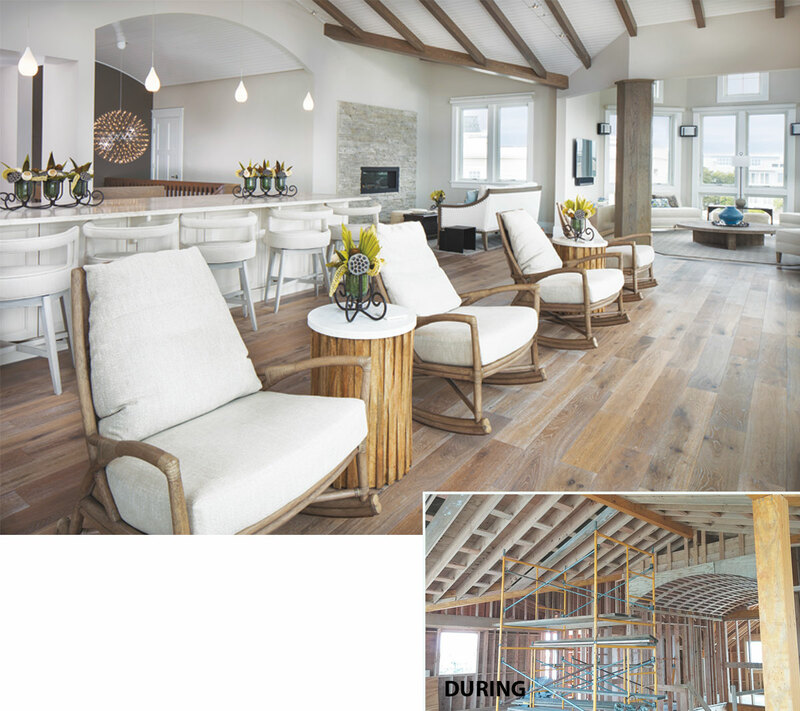 Thomas J. Keller, owner of Thomas J. Keller Building Contractor LLC in Surf City, New Jersey, opoints to the “hand-cut wood ceiling beams, vaulted barrel ceiling and crisp Craftsman trim work” as part of what makes this structure exceptional. The “charming cottage” turned out to be a little worse for wear. The architects explored the possibility of an extensive renovation project, but for Samach, it was clear from the outset they would need to tear it down and start over. Design NJ: What was your plan for this project? Raphael Samach: We approached this in a very unconventional manner. 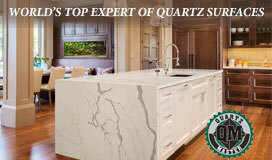 We focused on the site, our client’s attitude toward the site and our own personal perspectives. It’s a typical Harvey Cedars lot; the small size of the property was a challenge. What’s unique is that it has this magnificent view of the bay and it’s adjacent to a sanctuary. We had to fit that home in the space in an optimal way to capitalize on the view. Philosophically, the house follows the mythology of the Roman god Janus: basically a two-faced approach. [Janus has two faces: one looks toward the past, the other toward the future.] The front of the house has a cottage aesthetic. The back opens up to embrace the view. DNJ: What was the homeowner looking for? DNJ: What issues are involved when building in a beach community? Thomas J. Keller: All of the homes we build on Long Beach Island must meet base flood elevation requirements set by the Federal Emergency Management Agency. The elevations required for each individual property vary based on location. For example, is it oceanside or bayside? Each municipality also has its own height requirements at or above base flood. To ensure accuracy, we work with an engineer/surveyor who calculates how high and where we need to build to comply with all state and local laws. We built this particular home 5.6 feet off the ground. DNJ: How do you ensure that a home is able to withstand severe coastal weather? 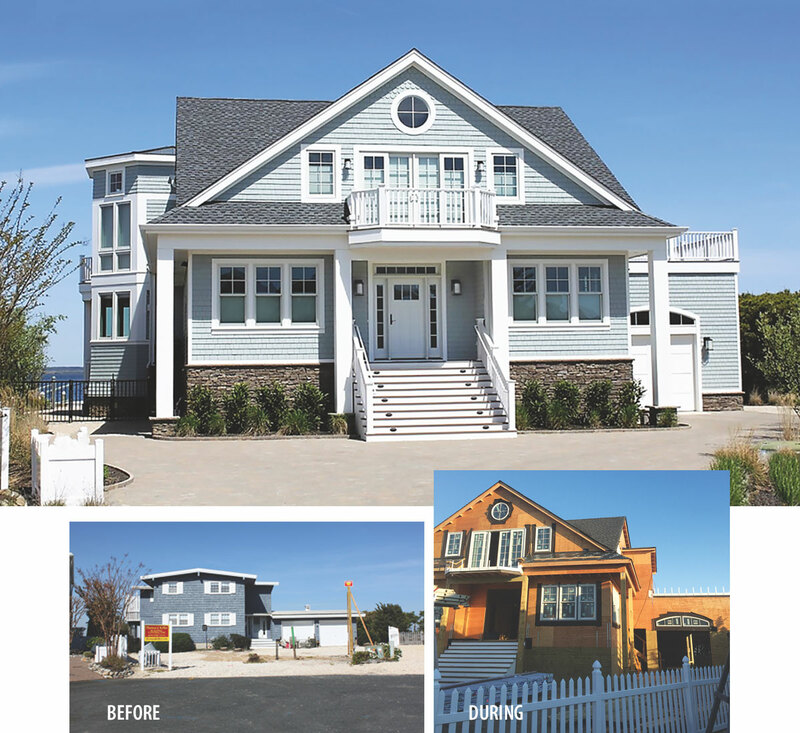 Keller: From our 40 years of experience building on the island, we know where to increase protections, where the elements are likely to breach a home’s exterior because of extreme, wind-driven rains and the overall coastal environment. We take extra care with roofing, siding and windows through better and increased flashing (corners where roof meets siding, etc. ), using high-quality building paper (which prevents water from going into the sheathing under the siding) and using extra caulking around windows and doors. In this home we used impact-resistant glass, which keeps any flying debris from breaking the glass. Before a storm, there is no need to do anything other than tie down or put away outside furniture and other items. DNJ: How does the homeowner use this house? Samach: This residence is about hospitality. It needed to accommodate large groups of visitors, but still feel very intimate for one or two people. And it had to work in all four seasons. We drew on our experience designing hotels and resorts, which is very much about creating multiple spaces where people can either gather together or break away. So we included a lot of places that are semi­private, such as the turret room and a great room to accommodate large groups of people. DNJ: How does the architecture help to make larger spaces feel cozy? Samach: We spent a great deal of time fine-tuning the scale and volume of the interior spaces. The relationships between spaces were precisely and deliberately planned. The great room faces the bay and is the most dramatic space, featuring an articulated ceiling running along a central spine, directing eyes to the bay outside. 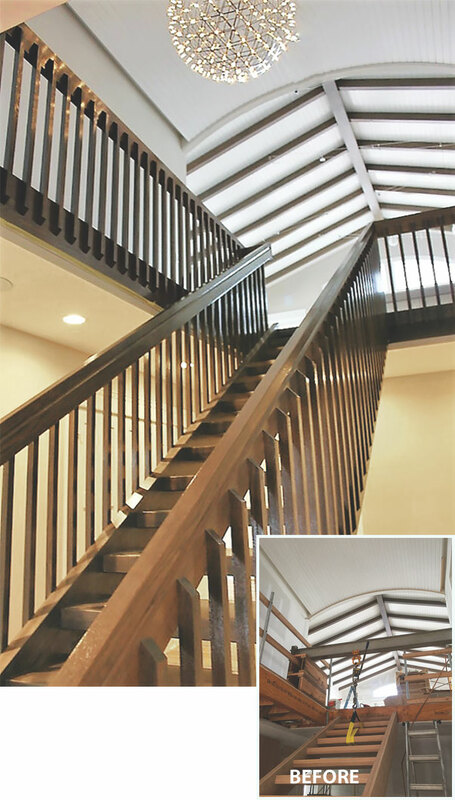 [Architectural articulation describes a structure with precisely defined elements that stand out clearly.] The ceiling slopes in two directions, creating more intimate spaces in the kitchen on one side and the fireplace seating area on the other. 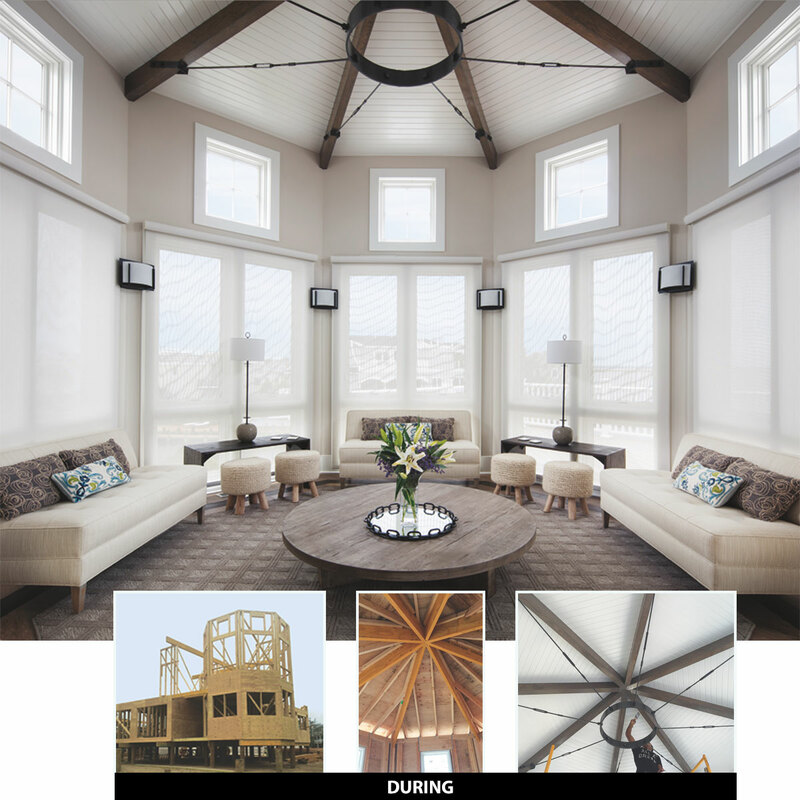 An octagonal seating area next to the great room has views to both the bay and the inlet and an articulated ceiling peaking at 15 feet, 6 inches. Sitting in this semicontained, high-ceilinged space with its tall windows is both relaxing and intimate. 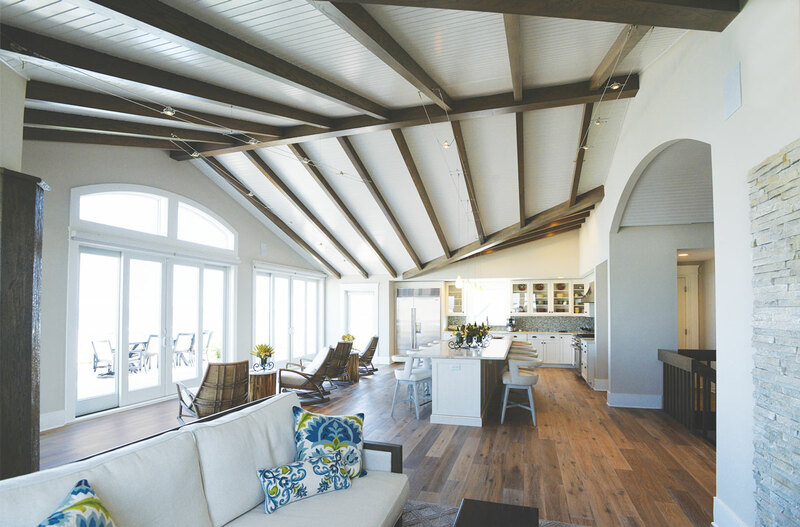 The dynamic nature of the ceiling pays homage first and foremost to the view, but also to the spirit of great interior spaces in traditional Shingle-style homes of the late 1800s. Moving through the space, one can feel the difference in the volume above, intuitively understanding the sense of calm and peace of the overall design. There’s nothing cavalier about anything in this house. It has an intimacy to it that makes it feel warm. DNJ: What does the homeowner like best about this project? Keller: Honestly, it was everything: from the architectural design to the construction process, including all of our trades and their personal interaction with the homeowner and the kitchen designer and interior designer. Everything was seamless. The relationship among all the parties involved was one of trust and respect. Samach: I have to give a shout-out to Tom Keller. He and his firm did a remarkable job of building an atypical house. The construction is meticulous. I really want to congratulate them for the level of craft that they brought to this process. 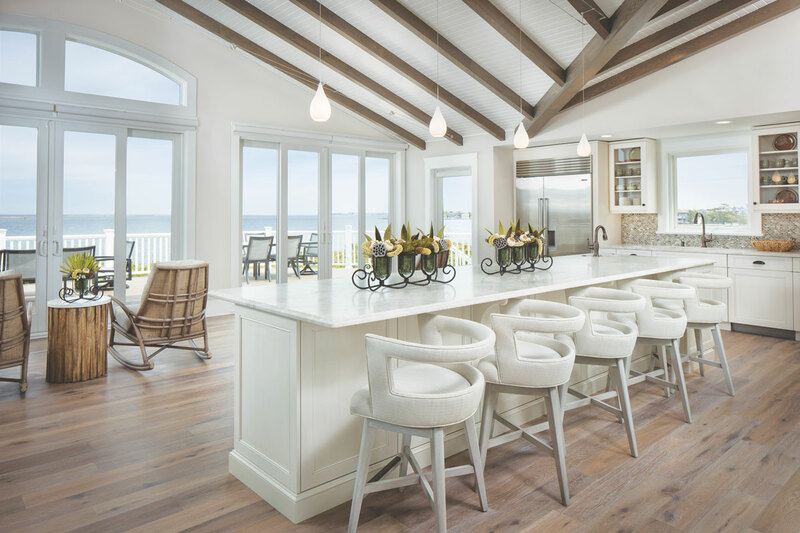 Overall: builder, Thomas J. Keller Building Contractor LLC in Surf City; architect, Samach + Seo Architecture & Planning LLP in New York City; interior design, Exquisite Design in Sewell; lighting, Hubbardton Forge in Castleton, Vermont; wood flooring, Avalon Flooring in Manahawkin. Exterior: white cedar shingles, Fraser Wood Siding in New Brunswick, Canada; windows, Andersen Corp.; driveway pavers, Reynolds Landscaping and Garden Shop in Manahawkin; landscape design, architect D.B. Seo of Samach + Seo Architecture & Planning LLP, installed by Reynolds Landscaping and Garden Shop; Timberline roof, GAF Materials Corp. in Parsippany; decking, Azek Building Products in Succasunna; glass railing on deck supplied by Causeway Glass Co. in Ship Bottom, installed by Thomas J. Keller Building Contractor LLC. Kitchen: design, Francie Milano Kitchens Inc. in Ship Bottom; wall color, Sea Salt by Benjamin Moore; cabinetry, Wood-Mode Fine Custom Cabinetry; quartz leathered countertops, Renaissance Marble and Granite Inc. in Blackwood; faucets, Newport Brass; appliance package, Sub-Zero and Wolf; counter stools, Coastal Living by Stanley Furniture; rockers, Palecek. Fireplace Area: fireplace stone, Boral Stone in Roswell, Georgia; custom carpet, designed by Exquisite Design LLC, Beatrice & Martin in Philadelphia. Turret Seating Area: custom carpet, designed by Exquisite Design LLC, Beatrice & Martin; custom furniture, Exquisite Design LLC. Master Bedroom: furniture, Mitchell Gold + Bob Williams in Paramus, carpet Kelley Karpets in Pitman.